Burglary is Real... Protect Your Family! I was eating a King Philly for lunch at the Cheese Steak Shop in San Ramon. We were looking at the local paper and saw the title above: Girl hides in closet during a burglary. WOW! Being in the security business for years, we install ADT Monitored Security Systems for many people right after a burglary. However, the title caught my eye and just thinking about an eighth grade girl hiding in her closet while her home is being ransacked by burglars is frightening. This story made me feel terrible about the what people experience during a burglary, "Tanya shivered in fear", and the significant danger when a burglary becomes a home invasion. 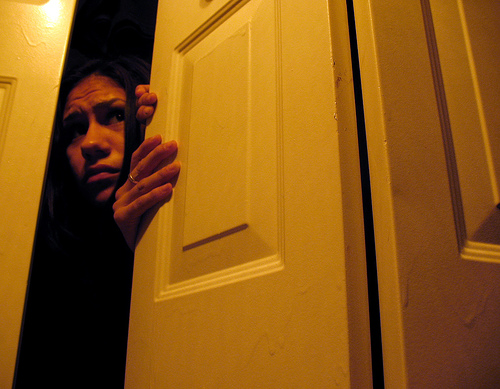 CHECK OUT THE STORY: Girl hides in closet during a burglary. While reading the story, I can see several things that you can do to help prevent something like this not happen to your family. See tips below. Based on the story there are several tips I can see to help protect your family from burglary. "Neighbors told officers they saw the white van casing the neighborhood around 2pm". This was an hour before the burglary. SOLUTION: Get a home security system and make sure your security sign is easily visible from the street. Also place security stickers on windows and patio doors to show would be burglars that your home is protected and being monitored. Also, park your cars in the garage. If you park your cars outside, it is easy to detect when you are home or away. By parking your cars in the garage it is harder to determine when you are coming or going. According to another article about the story, "Investigators say the girl's family had been moving into the home..."
Your new neighbors may not know who you, your friends or family are. It is easy for a burglar to lie and say they are helping you move or doing some of the construction. SOLUTION: Get a burglar alarm system installed as soon as you get the keys to your new home. It is now yours and needs to be protected. Most security systems installed today are cellular, so all you need is power for a security system to be installed. "Someone pounded on the door and rang the door bell". This is often the burglar's last attempt to see if anyone is home. Most often, the best thing to do is go to the door and say you are not interested right now. The would be burglar will typically just walk away knowing someone is home. It is so fortunate that no injuries were reported in this burglary. Items worth about $20,000 were stolen from the home. But knowing that Tanya is ok and free from harm is a truly blessing. Our families are what is most important in life and nothing is more important than protecting those we love and care for. See this video for another survival story: Julie Bender survives a home invasion with the help of her monitored security system. If you would like a free home security review call 1-800-310-9490.